The National Survey of Student Engagement (NSSE) collects information annually from samples of first-year and senior-year students to explore the nature and quality of their undergraduate experience. 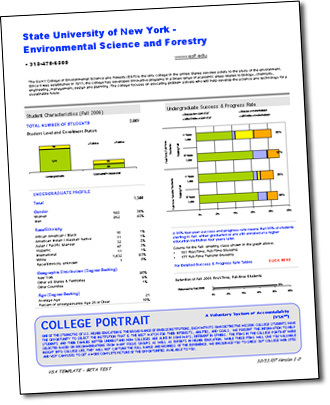 Since its inception, approximately 1,200 baccalaureate degree-granting colleges and universities in the U.S. and Canada have used the instrument to measure the extent to which students engage in effective educational practices that are empirically linked with learning, personal development, and other desired outcomes such as student satisfaction, persistence, and graduation. NSSE data are used by faculty, administrators, researchers, and others for institutional assessment, improvement, and accountability. Student-faculty interaction (both inside and outside the classroom). SUNY-ESF compares its student responses with the total NSSE survey group (585 four-year colleges in the US and Canada) and with a peer group of 49 research universities that share similar college characteristics. Our research universities peer group includes SUNY Binghamton University (NY), Clarkson University (NY), George Washington University (DC), Northeastern University (MA), Fordham University (NY), Catholic University (DC), Marquette University (WI), Clemson University (SC), University of Rhode Island (RI), and 40 other universities classified as "high research activity" institutions by the Carnegie Commission. The average student responses for college seniors enrolled at SUNY-ESF were higher than the benchmark averages for the NSSE (total) and Carnegie (research universities) peer groups in all five of the benchmark areas of student engagement measured by the 2007 NSSE survey. Student responses for first-year students at SUNY-ESF also exceeded the peer group responses in four of the five benchmark areas measured.